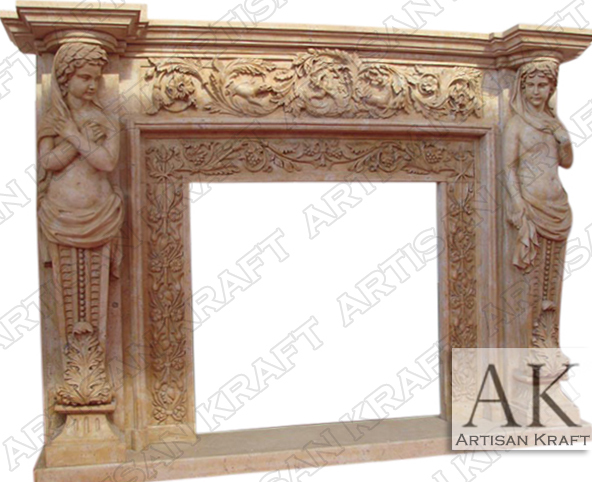 The Ornate Cherubim fireplace carved from cream marble into a beautiful and luxurious surround. Large statues flank the sides of the firebox. This is one of many statue style surround facings that we offer. We currently have a large marble Statue fireplace in stock. A decorative design to accent all the extravagant features in your home. Various flowers and leaves with give the cherubim their backdrop. The cherubim flow into the scroll of the legs. A large piece of art to sever as the center piece of the great room and the rest of the mansion. Stone sculpture facings such as this one run larger than other mantels. Typical Dimensions: 78″ wide x 56″ high *can be made to custom dimensions. Stone: Marble, cast stone, limestone, sandstone, marble etc. Available in many different colors, textures and finishes.